You are buying the FlexiFit 431 Full Face Mask Headgear Fisher & Paykel 400HC302, manufactured by Fisher & Paykel. 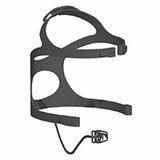 Fisher & Paykel is a leading manufacturer of CPAP Headgear and accessories. At ADW Diabetes, we do offer the complete product line by Fisher & Paykel at discounted pricing. You are buying the FlexiFit 431 Full Face Mask Headgear Fisher and Paykel 400HC302, manufactured by Fisher and Paykel. Fisher and Paykel is a leading manufacturer of CPAP Headgear and accessories. At ADW Diabetes, we do offer the complete product line by Fisher and Paykel at discounted pricing. Fisher and Paykel incorporated the FlexiFit Technology with auto-contouring properties, the Fisher and Paykel FlexiFit 431 Full Face CPAP Mask comes with an Under-the-Chin fit design and a highly contoured Silicone Seal for maximum comfort and stability in a full face CPAP mask. Offering an alternative to nasal cpap masks or nasal cpap pillows system, the FlexiFit HC431 Full Face mask comes ready-to-fit and wear right out of the box.